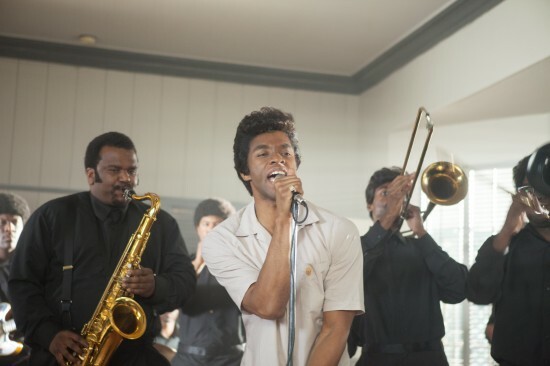 There seems to be a surprising lack of music-centric films scheduled for release in 2014, but one biopic everyone can look forward to is the story of the Godfather Of Soul himself, James Brown. Chadwick Boseman, who played Jackie Robinson in the 2013 film 42, will portray James Brown in the upcoming biopic, Get On Up. The film is scheduled to hit theaters in August, and just last night the first trailer found its way online. You can view the clip, which features plenty of timeless hit songs, below. It has been reported that Get On Up focuses on Brown’s return to stage in 1993 following his infamous prison stint, but filmmaker Tate Taylor has explained that the story will chronicle James Brown’s rise from extreme poverty to become one of the most influential musicians in history. I can’t be certain, but a setup similar to Walk The Line, which found Jonny Cash (Joaquin Phoenix) reflecting on life before a single major performance, could be used for this film as well. Get On Up opens August 1.